You have to change. If you don't change, you're going to die. That is the chilling realization that prompted Gulf War Veteran Michael Nguyen to turn to mindfulness practice to save his life when PTSD was running it into the ground. You have to change. If you don't change, you're going to die. That is the chilling realization that prompted Gulf War Veteran Michael Nguyen to turn to mindfulness practice to save his life when PTSD was running it into the ground. Although he was back home in the United States, when he went to sleep he returned to the combat zone, battling ghoulish enemies in dreams that were so intense that while he was sleepwalking he would punch out the walls of his bedroom. "I would be constantly fighting, kicking, screaming, swearing, having to patch up my walls pretty much every single week." Nguyen said, adding that he was a regular down at the Home Depot drywall aisle. In the day, an innocent remark would trigger him and send him into angry rages. He couldn't stay in a relationship, nor a job. His story is common among veterans, especially the 2.8 million veterans of Iraq and Afghanistan who have come home. The U.S. Department of Veterans Affairs estimates that 11 percent of the veterans from Afghanistan, and 20 percent of veterans from Iraq suffer from PTSD. Every day, 22 veterans take their own lives. Nguyen said that the feeling of isolation is debilitating for veterans. "When they're in the military ... they feel that cohesion as a group," he said. "But when they come home, and everybody goes back to their individual houses, then they feel like they're by themselves." Thoughts of suicide drove Nguyen to seek refuge at Plum Village Mindfulness Practice Center in France, founded by Vietnamese Zen Monk Thich Nhat Hanh. It wasn't easy. First he had to quit smoking cold turkey, and then he had to learn how to do sitting and walking meditation for several hours every day, while working through his PTSD symptoms. "On the sitting cushion there were a lot of times where I would really feel like I wanted to run," Nguyen said. "But I didn't want to be a monster anymore." While he was at Plum Village in 2003, he received the devastating news that seven friends he had served with died on the battlefield in Iraq and Afghanistan. Nguyen resolved to help other veterans heal from the scars of war. In order to do that, he needed intensive training. So he became a monk. "The more that you practice, the more you let go of the demon side," Nguyen said, adding that over time he became more gentle and friendly. "I smiled a lot more!" Mindfulness practice stresses an increased awareness of thoughts, emotions and bodily sensations. Distracting thoughts and feelings are not ignored nor avoided but instead observed as they arise and acknowledged in a nonjudgmental way. Some recent clinical studies suggest that mindfulness techniques can benefit veterans with PTSD. At the VA in Ann Arbor, Michigan, a group of veterans underwent eight weeks of mindfulness training. They did exercises such as mindful eating, in which they focus on sensations associated with eating very slowly, and body scanning, an exercise where they identified physical sensations in the individual parts of the body. At the end of the study, they showed significant improvement in their symptoms, especially when it came to what scientists call "avoidance." "Part of the psychological process of PTSD often includes avoidance and suppression of painful emotions and memories, which allows symptoms of the disorder to continue," says Anthony P. King, Ph.D., the study's lead author. "Through the mindfulness intervention, however, we found that many of our patients were able to stop this pattern of avoidance and see an improvement in their symptoms." In another study published this year by the UC San Diego School of Medicine, mindfulness techniques seemed to change the way people's brains respond to and recover from highly stressful events. Marine infantrymen in four platoons received training in mindfulness techniques for eight weeks, while two companies received no training. Then, they all spent a day immersed in simulated combat in a 32,000-square-foot training facility staged as a Middle Eastern village and responded to a highly realistic ambush. The scientists found that the heart and breathing rates of the mindfulness group returned to normal levels faster than those who received no training. MRI scans of their brains revealed that they had lower activity patterns in the anterior insula and anterior cingulate, which regulates emotional reactivity and the body's homeostasis. These patterns resembled those found in Navy Seals and elite athletes. Nguyen has been training in mindfulness for the last 12 years. This year, he organized a weekend retreat for veterans of the Iraq and Afghanistan conflicts and their spouses at Blue Cliff Mindfulness Practice Center in New York state. "Welcome Home, How to Truly Come Home" is a pilot program that trains vets in mindfulness and trauma releasing exercises that they can use day in and day out. It also stresses the importance of getting plugged into a community, and connecting to a local VA system, vet center, and meditation group. He plans to organize additional retreats in the future. 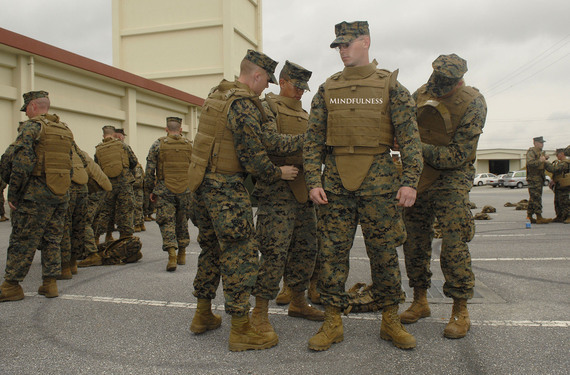 "What I tell them is that mindfulness is like their body armor," Nguyen said. "Being in the military, we would never think about going out on patrol or going outside of the wire where our base camp is without our body armor on. So now in civilian life, the practice of mindfulness is your body armor to help you get through." For more blog posts on mindfulness, connect with Daisy on Facebook.